Turkey is often hailed as the place where east meets west and is a fascinating country packed full of stunning sights, beautiful beaches, a fabulous Mediterranean climate and gorgeous mouth-watering foods bringing your taste senses to life. There is a huge range of resorts packed with loads of activities, modern hotels and ancient architecture. A holiday in Turkey really does offer something for everyone. Holidays in Turkey are an exotic mix of new world meets old, where modern resorts are close to many historical ancient cities and monuments. For many, Turkey was an exotic and mysterious country that in recent years has become one of Europe's most exciting holiday destinations. 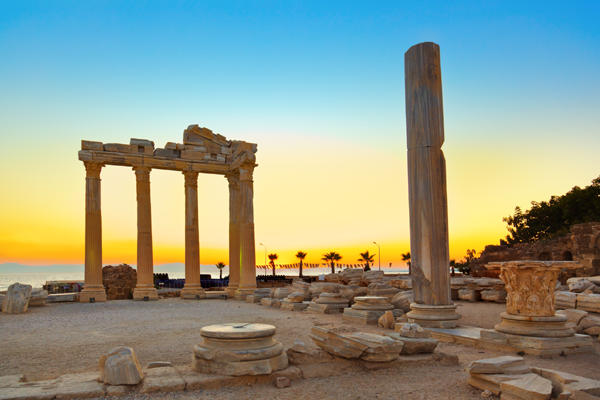 Whether you are looking for sun, sea or history, a Turkey holiday will be a perfect choice. Situated at the crossroads between East and West, Turkey is a unique holiday destination. The city of Istanbul is the only city to be situated on two continents, Europe and Asia. The variety of resorts in Turkey is pretty much unique, from stunning beaches, to mountainside luxury, there really is something for everyone no matter what the age. Families love the beaches around Altinkum, Icmeler or the Antalya coastline, night-owls head for larger livelier resorts such as big and brash Marmaris or Bodrum and nearby Gumbet, couples enjoy more intimate resorts such as the riverside Dalyan or the mountain village of Kalkan complete with its fantastic range of restaurants offer stunning views overlooking the picturesque bay. 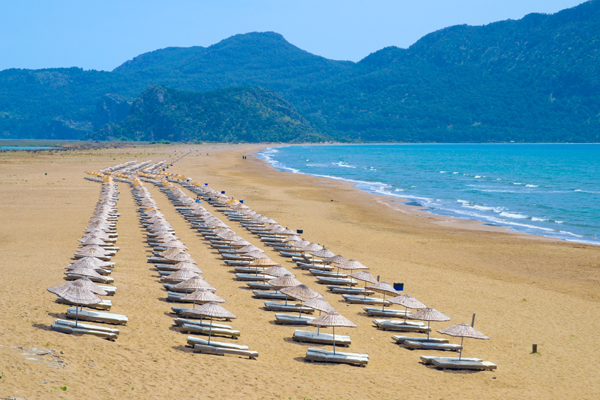 Turkey has some of the best beaches in the Med and many of the resorts offer easy access. Soft sands are gently lapped by crystal clear waters and the beaches offer a wide choice of water sports as well as places to lie back and enjoy the warm sunshine or a splash and swim in the warm shallow waters. A boat trip is a must on a Turkey holiday and it gives you the chance to explore deserted bays and also have a swim in the cooling turquoise waters. On the Mediterranean coast, Antalya offers the contrast between the historic town and sumptuous beaches with resorts such as Alanya and Side proving to be consistently popular with British and international visitors. 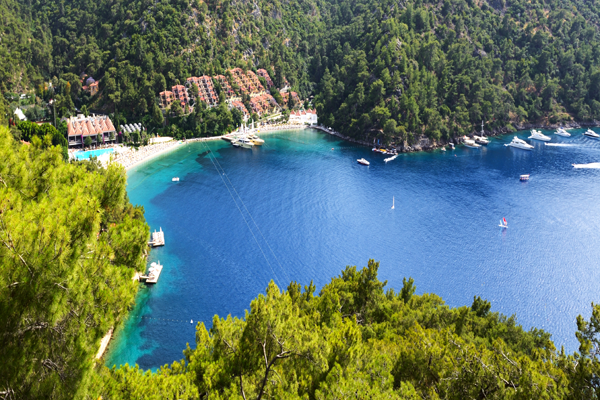 Dalaman offers something for everyone from the buzzing bars of Marmaris to the bustling market town of Fethiye, which offers a slice of modern Turkish life. 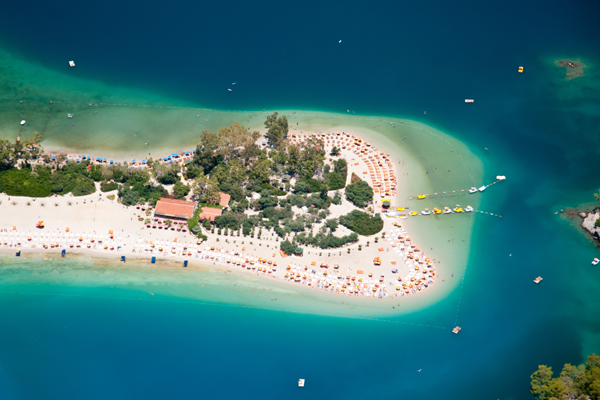 Olu Deniz is famous for its stunning beach and magnificent mountains where you will also find the lively Hisaronu, as well as the nearby National Park giving you an option to recuperate when beach inactivity gets too much. Then there is the sophisticated resort of Icmeler, which offers great nightlife and beach life in equal measure. Stretching south from Fethiye, the coastline largely comprises of superb beaches, such as the one at Patara, with photogenic little towns like Kalkan and Kas nesting in the foothills of magnificent mountains. The sunken city at Kekova is a particularly intriguing signpost of the turbulent past of this fascinating region. Everywhere you will find a very mild winter, warm spring and autumn and a typical southern Mediterranean summer. The glorious Aegean coastline of Turkey, lapped by the clear blue waters of the Aegean Sea, starts near Troy (Canakkale) at the southern end and the straits of the Dardanelles and continues all the way down to Marmaris. Dotted with idyllic fishing harbours, unspoilt beaches surrounded by olive groves, secluded bays and popular holiday resorts, the Aegean region is especially rich in history relics accumulated over 5,000 years. This area of Turkey enjoys a very pleasant mild climate with soft, verdant springs, hot summers, sunny autumns and warm winters with rain. All inclusive holidays in Turkey are very popular with many family friendly hotels even offering on-site water parks as well as numerous activities for all ages. 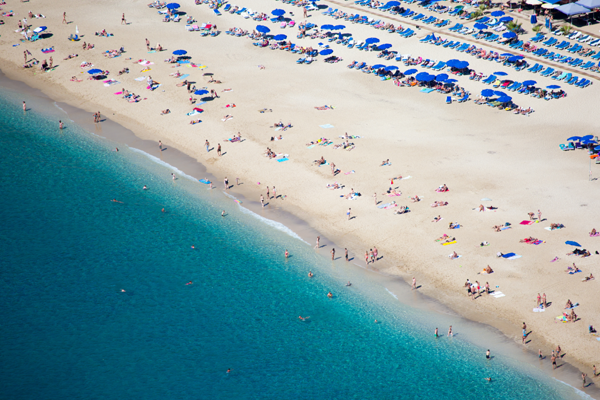 All inclusive hotels range from small family run affairs to huge resorts with private beach front locations. Self catering holidays in Turkey also remain popular thanks to the great value for money supermarkets and of course the fantastic range of restaurants on offer. Turkish regional cuisine is delicious and amazing examples can be found in all the resorts scattered along the tourist areas. There is also superb fresh seafood to savour in the coastal areas such as Olu Deniz, Kalkan and Bitez. You will find lovely local produce available at many of the market towns too with fresh fruit and vegetables dishes on offer. Dining is a delight in Turkey as the cuisine is so varied. Especially popular are the savoury appetisers “Meze” kebabs of all kinds (much better than the UK fast food variety), “Borek” pastry stuffed with meat or cheese, stuffed vine leaves, seafood of various kinds, sweet pastries, and of course dark Turkish Coffee. You will find every kind of restaurant, from the luxury class, with imposing international menus, to typical small town eating-houses. There are no shortages of national parks in Turkey and several of these protected areas include beautiful beaches such as Dilek and Patara on the west coast and the famous blue lagoon beach at Olu Deniz, possibly one of the most photographed beach in the world, which is on the beautiful Turquoise Coast. Turkey has been described as “The cradle of civilisation” and a visit will reveal why this is literally true. Signs of the distant past are everywhere. A Neolithic City, Catalhoyuk in central Turkey dates back to 6,500BC and is believed to be the world’s first town. The heir to 26 Centuries of consecutive, but widely different cultures, has made Turkey a veritable paradise of cultural wealth. Some of the exotic visitors to Turkey have been Hittites, Lydians, Persians; Romans land Byzantines all contributing to the richness of Turkish culture, much of which is still very much alive today. The present republic was born out of the decline of the Ottoman Empire, considered one of the greatest Empires the world has ever known. Dining is a delight in Turkey as the cuisine is so varied. Especially popular are the savoury appetisers “Meze” kebabs of all kinds (much better than the UK fast food variety), “Borek” pastry stuffed with meat or cheese, stuffed vine leaves, seafood of various kinds, sweet pastries, and of course dark Turkish Coffee. You will find every kind of restaurant, from the luxury class, with imposing international menus, to typical small town eating-houses. Have a browse around our site or give one of our friendly team a call today!